Major gifts by dedicated patrons have often been the building blocks of museum collections. The Hammer Museum is proud to be the recipient of a substantial promised gift from our longtime supporters Susan and Larry Marx. This is the first public presentation of a selection from the extraordinary gift that the Marxes have pledged to the Hammer. The Marx Collection comprises more than 150 paintings, sculptures, and works on paper made by 109 different artists. This postwar collection includes many exemplary works by seminal abstract expressionist and conceptual artists, alongside exciting works by newer artists, and will complement the Hammer Contemporary Collection. The exhibition is curated by Douglas Fogle, chief curator and deputy director of exhibitions and public programs at the Hammer. When we look at a picture (a painting, a drawing, a photograph), what do we see? A collection of lines, shapes, or planes of color that in some cases resolve into recognizable figures and in others fall apart into a cascade of abstract forms. The history of modern art is littered with the remains of the seemingly unending battle between figuration and abstraction. This contest has played itself out as an art historical pendulum that has swung back and forth from one pole to the other—from the presumed factuality of photographs to the decidedly interpretive expressions of abstract paintings—with factions formed, battles waged, and lines drawn in the sand. In some ways, this debate has been active since the Renaissance, when writers such as Leon Battista Alberti suggested that painting could be seen as a window on the world. While the subsequent centuries have seen the increasing collapse of verisimilitude in a tumultuous dance between figuration and abstraction, the real question at the core of these debates has always been exactly what world it was that lay just beyond the frame of that window. The passage from Bachelard’s book The Poetics of Space that serves as an epigraph for this essay came to mind after a discussion that I had with collector and Hammer Museum patron Larry Marx during the planning of the current exhibition. In response to my question about his motivation for collecting art, he said, “Art is about where it takes me.” Art has taken Susan and Larry Marx to several continents and across a number of decades. The intimacy of mark making in the form of drawing has become the basis of their travels to the spaces of elsewhere. The Marx Collection comprises more than 150 works, including drawings, paintings, and sculptures by more than one hundred international artists from the post–World War II period. 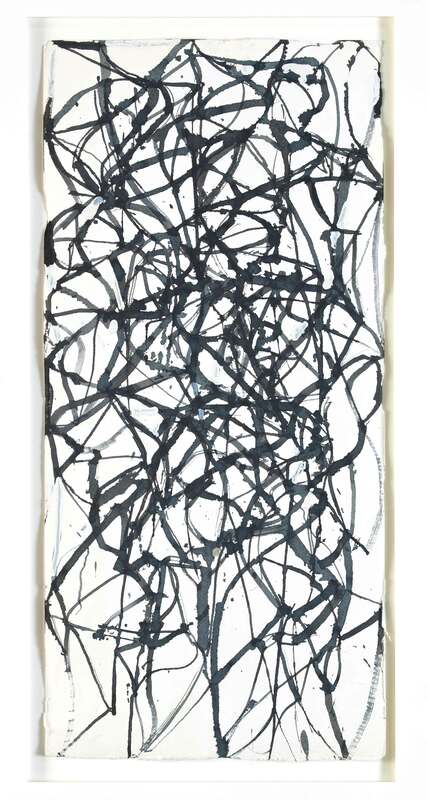 The works in the collection include seminal examples of abstract expressionism on both paper and canvas by the American artists Jackson Pollock and Willem de Kooning, as well as works from other contemporaneous movements around the world by artists such as Yayoi Kusama and Mira Schendel. All the while they have been acquiring works by younger contemporary artists, including Mark Bradford and Rachel Whiteread, in order to demonstrate the continuation of their chosen themes in the current artistic milieu. Major gifts by dedicated patrons have often been the building blocks of museum collections. The Hammer Museum, itself founded on the basis of a personal collection, is proud to be the recipient of a substantial promised gift from the Marxes, who are longtime supporters. This exhibition is the first public presentation of a portion of this extraordinary gift. 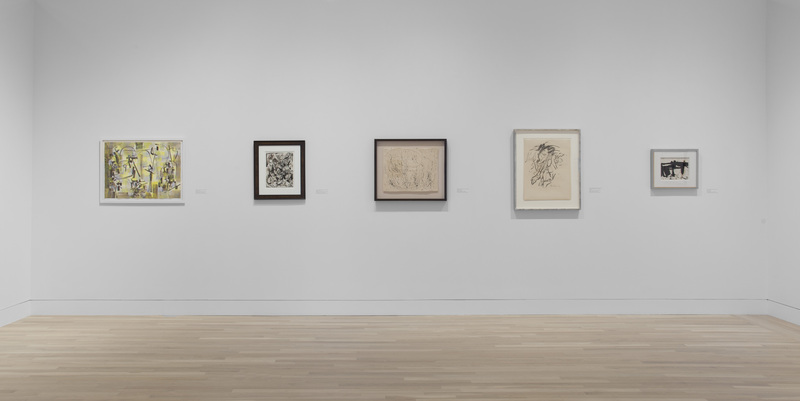 This selection of works from the Marx Collection highlights its strengths, beginning with a group of major works on paper and canvas by a number of artists associated with abstract expressionism, including de Kooning, Pollock, Joan Mitchell, Ad Reinhardt, and Mark Tobey. If the Marx Collection finds its grounding in abstract expressionism, the selection of works on view at the Hammer Museum shows how it continues to branch out into an exploration of the morphing of the line from an abstract gesture into more concrete concerns with geometry (Ellsworth Kelly and Blinky Palermo), compulsive repetition (Kusama), and resolving a series of seemingly wild lines into quasi-figurative forms (Eva Hesse and Sigmar Polke). The collection then takes a turn into the world of conceptual art with prime examples from Mel Bochner and Sol LeWitt, who each adopted a more methodical and rigorous approach to rendering the line. The hard-edge lines of conceptual art then give way to a wide range of other artistic concerns, with a more lyrical and expressive movement of lines across the surface in works by artists such as Brice Marden and Cy Twombly, the pop-like resolution of the line into typography in the work of Ed Ruscha, and the continuing battle of the line with itself in a dance of abstraction and figuration in the work of younger artists such as Mark Bradford, Sergej Jensen, and Rachel Whiteread. What becomes clear when one looks at the varied works in this collection is that, despite the diversity of approaches and the broad geographic and temporal span covered, there is a consistent, unifying set of concerns. Foremost among these concerns is the overwhelming question of how the rendering of a line in either graphite or paint can come in or out of metaphorical focus as an abstract or figurative form that invites us to travel to another world. A tour through the Marx Collection is nothing short of a road trip through a set of different possible iterations of how line can be manipulated to lead us to a realm of daydreams. 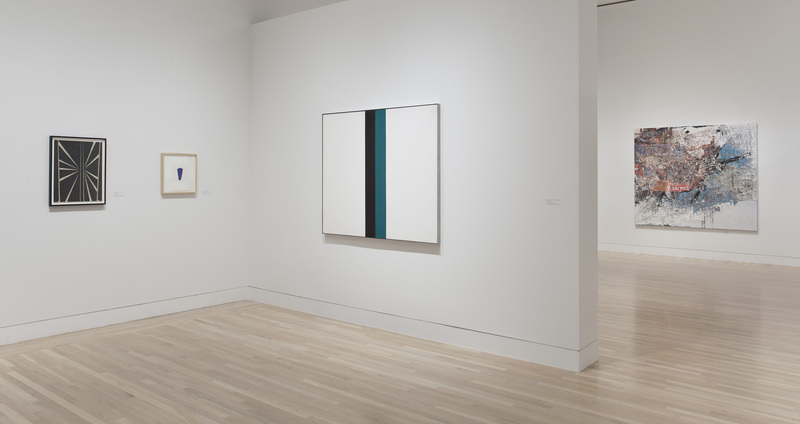 When looking at this collection and contemplating the idea that art can be a launching pad for the travel inherent in reverie, it seems somewhat paradoxical that the collection exhibits an overwhelming propensity for abstraction. Would it not make more sense to look at figurative or representational work if we wanted art to transport us to another place and time? The paradox is that the more abstract a work is the more open it is to the possibility of entering it from a multitude of angles. Rather than closing down possible readings of a work with a literal meaning, abstraction allows one to daydream. One of the earliest works in the Marx Collection exhibits just such a tendency to provoke a reaction in the viewer. 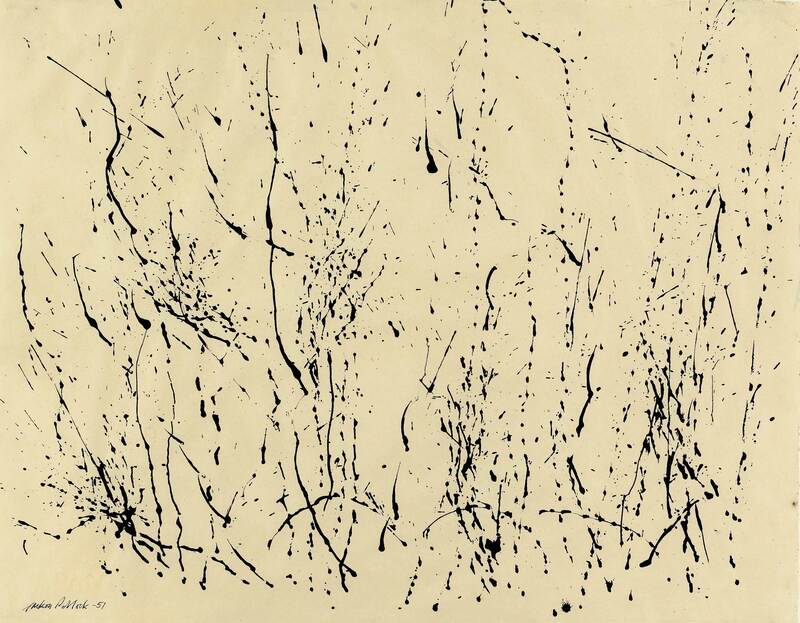 In Jackson Pollock’s untitled drawing from 1951, we see a series of staccato drips and dotted lines rendered in ink dance across a fragile piece of paper. At first these markings seem random, the result of some chaotic natural event such as a rainstorm or a gale-force wind blowing through a field of grass. As we keep looking at this work, however, the seemingly random markings start to resolve into the traces of a controlled set of human movements across a sheet of paper. Each drip becomes a record of a hand moving through the air as if we are somehow being greeted with an archaeological record of human movement through time. In this sense, the drawing is a palimpsest that, far from being reductively abstract, is actually the oh-so-factual record of the presence of a human intellect. Indeed, this seemingly mute, completely humble, and incredibly intimate collection of ink stigmata starts to tell a series of stories of the balletic collision of events playing themselves out across a cosmic battlefield on which lines intersect, diverge, break apart, and are born again. Or, alternatively, the ink suggests the scent trails secreted by ants to help them find their way back home. Or perhaps the lines become figures contesting their brethren in heroic battles that are to be forgotten by history, leaving only their ghosts in the form of the ink that has soaked into the paper. Like any good work of art, this delicate drawing opens up a portal to the world of daydreams and gives us a ticket to a place far different from the one that we normally inhabit. At the same time that Pollock was changing the way that the world thought about abstract painting, other artists around the world were making parallel explorations of the picture plane. Working in Tokyo in the 1950s, Yayoi Kusama put her own stamp on the battle between figuration and abstraction. In her 1953 work Accumulation, we see the simple act of mark making take on an obsessive quality as dots of ink are repeated over and over on a simple sheet of paper. At first the idea of compulsion would seem to presume the uniform repetition of an action in what might be seen as an attempt to erase any kind of difference or irregularity. The more one looks at this drawing, however, the clearer it becomes that the repetition present in it is all about individuality. Moving up and down the paper, each mark has its own intensity and becomes its own unique figure within a field of sameness, just as two musicians might interpret the exact same set of notes completely differently. What we see here is difference through repetition. Kusama’s accumulation is an accumulation of marks on a sheet of paper but also an accumulation of distinct individuals within a coherent community. The marks vibrate with energy, moving back and forth and in and out of focus like single-cell organisms from a drop of pond water observed under a microscope. These worlds within worlds are not simply the purview of abstraction even if abstraction does seem to leave its subjects more open to the realm of daydreams. The Marx Collection has not eschewed the more traditional form of figuration; it has simply framed it as a question as much as an answer. We can see the perpetual dance between figuration and abstraction play itself out among the artists in this collection or, in some cases, within the oeuvre of a single artist over the course of a career. This trajectory can be seen clearly in the production of Philip Guston, who is represented in the Marx Collection by abstract expressionist works such as the ink drawing Fall (1953) and the gouache Mott (1958), as well as later cartoonish forays back into the realm of the figure, including an untitled drawing from 1969 and Current (1976). The interesting thing about Guston’s work is that in some ways we can read the later figurative works not as those of a messianic convert but rather as an excavation of the worlds already embedded in the abstraction that he embraced as an original member of the abstract expressionist generation. These cartoon forms are simply the resolution of the dense clusters of lines that played across his early drawings, each aspiring to coalesce into a ghostly figure. In his later work the ghosts have materialized into hooded figures populating alien landscapes that still allow us to move into the domain of daydreams. One can see Guston’s internal dialogue play itself out between two contemporaneous German artists in the Marx collection who began working in the 1960s. Blinky Palermo and Sigmar Polke each approached painting and drawing from very different positions. Palermo explored the legacy of modernist geometric abstraction yet eschewed romantic notions of the sublime, while Polke was more interested in the factual quality of contemporary visual consumer culture. Palermo’s colorful geometric drawings and stretched canvases, with their roughly hewn planes of color and agitated bending angles, provide an apt counterpoint to Polke’s loosely rendered gouache and watercolor drawings that depict three forlorn trees in the landscape, in one example, or a series of doodled lines that attempt to cohere into a face. Less a battle and more a series of open possibilities in an expanded field of artistic dialogue, the work of Palermo and Polke emerged in a world where the ground had been cleared by previous artists and it was possible to embody multiple artistic voices and strategies. In some ways, language itself can be seen as the mediating point between the positions occupied by Palermo and Polke. At the same time that they were beginning their careers in Germany in the 1960s, Ed Ruscha was taking up the question of figuration and abstraction from a completely different angle. For Ruscha, language itself became a concrete if strangely abstract entity. In paintings by the artist such as Radio (1963), typography is reduced to a graphic form of geometric abstraction. Painting the letters that compose the word radio in ink and oil on paper, he renders it strangely mute. Arranged as if they are radiating from the vanishing point of a Renaissance painting composed using one-point perspective, these letters at one and the same time broadcast their signal . . . this word . . . for all to hear while reducing the word itself to a series of typographic markings that are more form than content. The paradox here is that Radio is strangely silent, or perhaps it is not so much silent as it is a floating idea that is no longer tethered to any story. In this case, the factuality of the world of language, its concrete typographic reality, has taken precedence over its meaning. 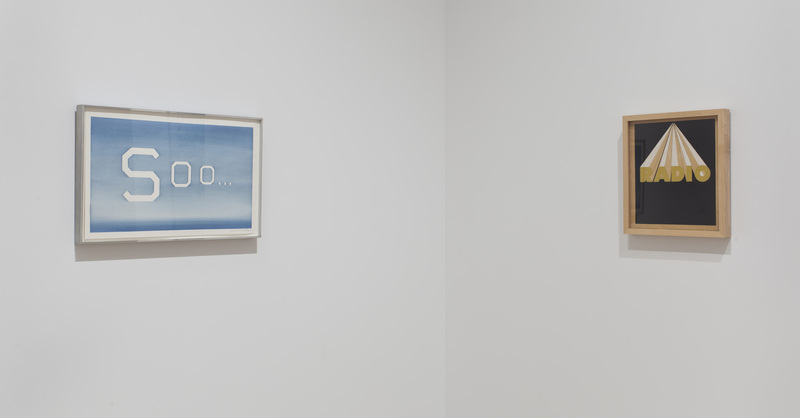 In freeing language from its literal meaning, Ruscha allows this word to hum with the electric energy of form and, in doing so, allows Radio to become a portal to another world. If graphic language in the form of typography allowed Ruscha to launch painting and drawing into a new world, works such as Twombly’s Untitled (Roman Note) (1970) negotiated the divide between linguistic intelligibility and the cacophony of the curse of Babel. Twombly’s signature script invokes the automatic gestures of the abstract expressionists while straining to resolve itself into legible handwriting. As his hand moves back and forth across the paper with pencil and crayon, language does not make itself present. At the same time the work opens itself up to a new kind of reading that takes the viewer to a place where language does not obey any codified rules of grammar or ideographic uniformity. 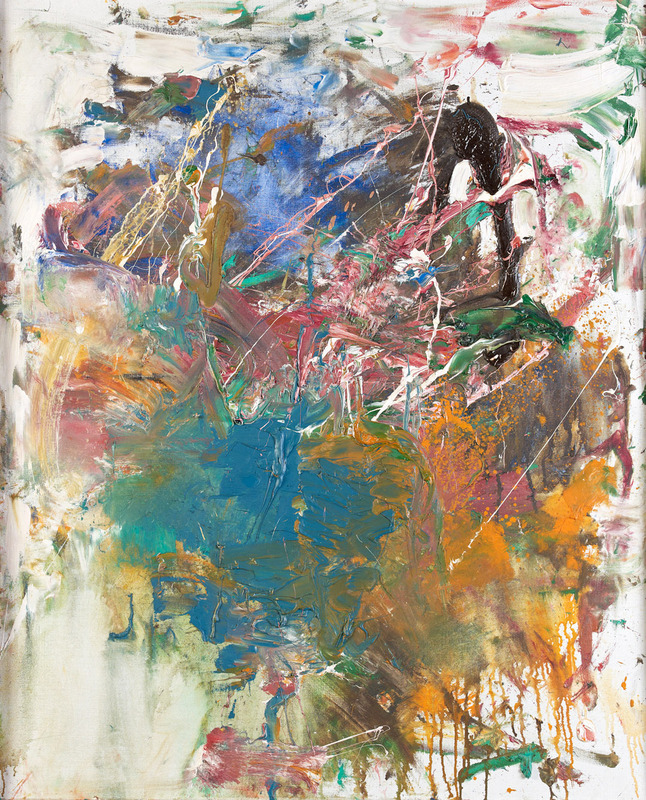 Twombly’s is a dream language that one can never quite remember when one wakes up. Nonetheless, it draws its power from the cryptographic world of language that infuses our lives and makes us human. It is a kind of concrete poetry without words, a kind of static or white noise that somehow also transports us to another place. 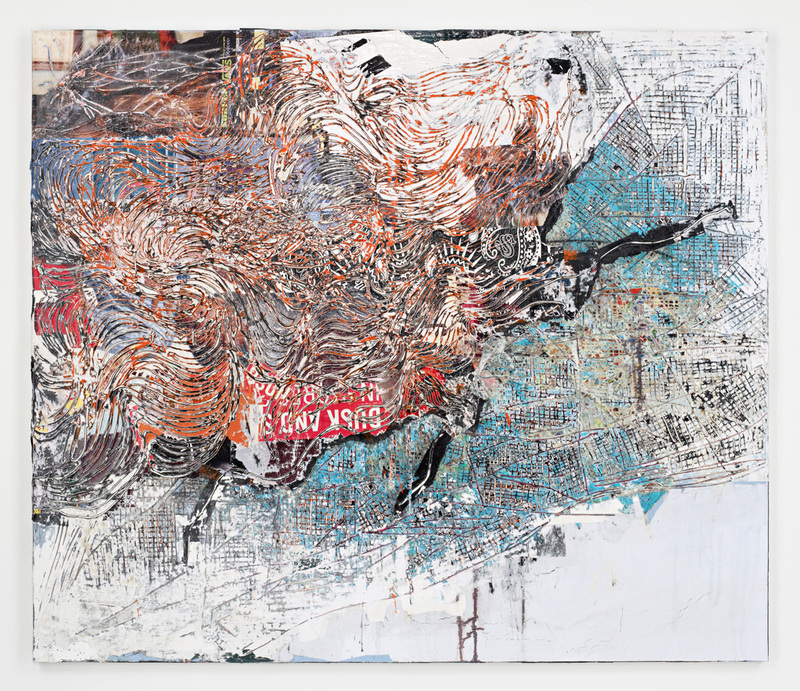 Finally, we come to Mark Bradford’s painting Smite (2007). In some ways this work is the logical culmination of the Marxes’ collecting to date, bringing together painting and drawing, paper and canvas, and abstraction and figuration. Bradford’s paintings are strange hybrids. Evoking the legacy of Robert Rauschenberg’s combine paintings, Bradford travels through the city of Los Angeles looking for paper. Specifically, he searches for the accreted layers of wheat-pasted commercial posters that appear on construction fences, telephone poles, and other elements of the contemporary urban environment. Taking these back to his studio, he attaches them to his canvases, placing one upon the other until they build up into thick, sedimented layers. He then takes various tools, including power sanders, and removes layers of material the way an archaeologist would excavate a site. In Bradford’s case, however, what is revealed by his practice are not the lost secrets of an urban world besieged by commercial posters. It is rather new worlds that become visible, a terra incognita where plate tectonics shift continents into collision courses with one another as strange weather patterns move across their surfaces. Neither totally abstract nor really figurative at all, Bradford’s works speak to the concrete reality of the world that we live in through their source materials while also opening up the picture plane as a gateway to another set of worlds that are available only through daydreams. One could almost imagine these works as satellite images of alien worlds that, if we zoom in closely enough, would resolve themselves into smaller entities perhaps resembling the drawing by Jackson Pollock that began this discussion. What works like Smite make clear is that the Marx Collection has grown organically along a set of intuitive parameters in which the intimate gesture takes precedence over the monumental declaration. Employing an economy of means, the artists represented in the collection are nevertheless able to uncover new worlds that are both immense and open to infinite interpretation. Epigraph: Gaston Bachelard, “Intimate Immensity,” in The Poetics of Space, trans. Maria Jolas (Boston: Beacon, 1994), 183–84.